Prepare a 9x5 loaf pan with nonstick baking/ cooking spray. Add the butter and sugar into a mixing bowl. Using an electric mixer cream the butter and sugar together until it is fluffy. Add in the vanilla and egg while the electric mixer is still beating. Slowly blend in the applesauce. Add the flour, baking soda, ginger, cinnamon, cloves, and nutmeg. Stir to combine. Add this mixture to the butter, egg, sugar mixture blending until it is mixed. Set aside the loaf until it slightly cools. Transfer to a cooling rack before frosting. Add the cream cheese and the vanilla in a mixing bowl. 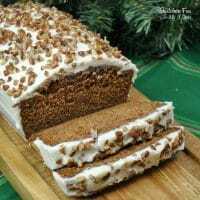 Spread a thick layer of the frosting over the gingerbread loaf. Sprinkle with chopped pecans.